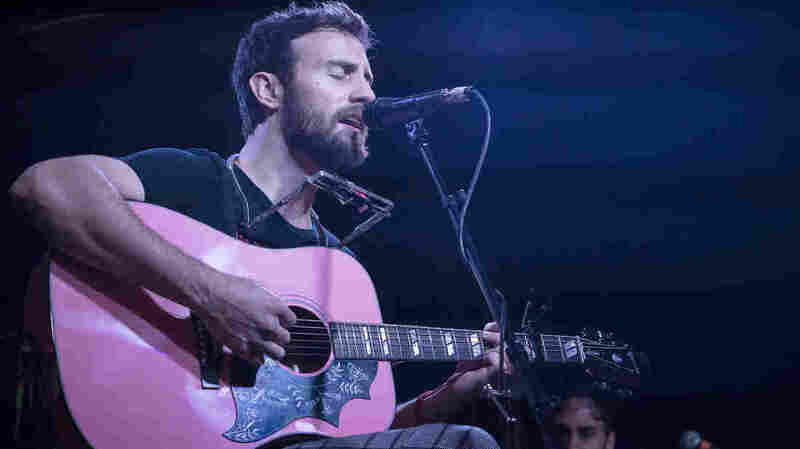 World Cafe Nashville: A New Music Roundup : World Cafe The new music that's come out of Nashville in recent months is an embarrassment of riches. Ruston Kelly performs live on the 2018 AmericanaFest's Day Stage presented by WMOT, NPR Music and World Cafe. The new music that's come out of Nashville in recent months is an embarrassment of riches. There's so much of it, in fact, that we risk overlooking a slew of notable new albums, EPs and tracks from artists who are either building on initial buzz, following up quiet debut efforts with bolder sophomore statements, reemerging after significant stylistic reinvention or delivering on their established reputations. Here's a wide-ranging roundup of talent in chronological order. Katie Pruitt didn't spend long waiting tables after college before her songwriting chops and Brandi Carlile-influenced ability to project riveting warmth and intimacy landed her deals with a publisher and booking agent. Between March and June, she released a series of live, in-studio recordings, through the OurVinyl YouTube channel. The duo Mocha started out with a much larger lineup before being pared down to singer Sakari Greenwell and bassist Sheila Graves. The duo's debut EP, Snack Time Honey, melds elements of funk, neo-soul, hip-hop and rock with a serene fluidity reminiscent of Meshell Ndegeocello. Petty has long been one of Nashville's broodiest, most artful MCs, building quite the catalog of mixtapes, albums and loosies over the past half-dozen years. The 18 tracks on Words I Couldn't Say, created by an array of locally and nationally known producers including Petty himself, masterfully balance intimacy, eccentricity and self-reflection. Leah Blevins started out as a backup singer before taking tentative steps toward the spotlight. On her second EP, Walk Home, she invoked the bohemian elegance of '70s soft rock and West Coast country-rock, draping her songs with the delicate tendrils of her Kentucky twang. Rapper Gee Slab has already attracted the attention of the storied R&B and hip-hop magazine Vibe, which paired him with Diplo collaborator King Henry for an EP. His latest album In Real Life, is a top-flight collection of conscious yet streetwise Dirty South rap with a drawling flow that's sometimes mellow, sometimes muscular and always knowing. Nashville native Saaneah combines college-honed music chops with experience working with vulnerable kids in the public school system and an emphasis on dancing and body positivity in her recordings and music videos. "Want You Now," an instantly appealing expression of female fowardness that she released this past summer, has a kinetic hip-hop beat, rubbery bass line and updated girl group harmonies. Kevin Gordon, a roots-rocking author of southern gothic narratives with an advanced degree in poetry, released his seventh full-length Tilt & Shine on July 27. On it, he wove historically informed, literary detail, surrealism and grit through guttural, rhythmically loose-limbed, blues-informed grooves. Performing under the name Whoa Dakota, Jesse Ott is one of the more dazzlingly, eclectic music-makers in Nashville's indie pop scene. On her album Patterns, modal banjo figures and mandolin strumming introduce synthy, dance-pop tracks, interspersed with readings of psychology texts and field recordings of her grandmother. The members of Sister Sadie, all seasoned bluegrass pros and all women, originally teamed up casually as a pickup band playing a one-off show at Nashville's storied The Station Inn. But the strength of the lineup (lead singer Dale Ann Bradley, fiddler Deanie Richardson, mandolinist Tina Adair, banjo player Gina Britt and bassist Beth Lawrence) convinced them to make their partnership a lasting one, and on the band's second album, simply titled II, Sister Sadie is at ease with hard-driving tunes and soft, sophisticated ballads alike. Cambodian-American singer and songwriter Bella Moon is a relatively new presence in Nashville's alt-R&B scene. She released her debut EP, Pink Potion, last year, followed this past August by her latest track "Blossom," a sensual confession of infatuation with misty vocal effects, pearlescent keyboards and an icy, minimal beat. Ryan Culwell is the sort of singer-songwriter that's often described as possessing grit — partly because of his gruff, chapped delivery and partly because of the bleak, grounded clarity of his lyrics. His tweaking of textures on his latest album, The Last American, has an equally visceral impact. This time, he's cocooned vignettes of isolation and arduous survival in layers of reverb, vapory effects and silvery steel. Daisha McBride began building buzz the new-school way, by posting videos of herself freestyling over other artists' beats during college. These days, the rapper is focused on original tracks like "No Strings Attached," on which she layers the spry, seesawing syncopation of her flow over unhurried production. Guthrie Brown made his pilgrimage to Nashville at the tender age of 17 and has been honing his chops as a charismatic pop-rock craftsman ever since. His latest EP, Keeping On, makes suave yet sensitive, musically-savvy use of airy R&B, folk-pop and doo-wop sounds. Kimberly Kelly started out on the circuit in her native Texas, taking notes from, and gigs with, Red Dirt songwriters and popular country stars. Now based in Nashville, she's released her first new music in eight years. The EP Don't Blame It On Me is a vital, vinegary collection of modern, hard country tunes. Kandace Springs, the daughter of a versatile, crowd-pleasing Nashville club singer, is now two albums into her own exploration of the smoky intersection of contemporary vocal jazz, coffeehouse soul and urbane pop. On Indigo, her feathery delivery provide a supple, sensual counterpoint to the digital crispness of the drum machines behind her. Mike Farris fronted the boogieing southern alt-rock band Screamin' Cheetah Wheelies from the early '90s until the early aughts before launching a solo career as a rootsy gospel shouter later that decade. On Silver & Stone, he's shifted into Memphis soul mode, mixing vintage covers with originals, but the biggest surprise is how gentle and contemplative he could be when the material calls for it. Elise Davis is recognized in Nashville songwriting circles for her ability to capture serrated emotions. She's raised the bar even higher with her sophomore album Cactus, teasing out the tensions between youthful infatuation and grown-up confessions of dissatisfaction and desire in songs whose arrangements range from acoustic spareness to sumptuous orchestration. Ruston Kelly didn't arrive at his own thing until after he'd achieved modest successes as a Music Row songwriter and weathered a bit of a lost period. But his debut full-length Dying Star, spun the introspection and self-deprecation of a beautiful loser into melancholy, meticulously crafted, singer-songwriter gold. A veteran of Nashville's garage rock scene, the guitar-and-drums duo JEFF the Brotherhood built its reputation on sludgy riffing, sleepily tuneful hooks and impishly out-there imagery. A few years back, real-life brothers Jake and Jamin Orrall began inching toward a more expansive sound. On Magick Songs the band is officially a quartet, with additional guests beside, all drifting through spacious, experimental, deeply hypnotic jams. David Nail spent a decade trying to make a go of it in the country mainstream, a gifted, moony balladeer in a format veering toward more youthful trends. After being dropped by his label, he embraced a band mentality with the Well Ravens. The band's debut Only This and Nothing More, submerged Nail's brooding lyrics and refined melodies in a haze of vocal effects and ringing, atmospheric guitar figures.